From 3:40 to 7 p.m. Sunday on Fox, nothing else mattered in the TV firmament except the Dallas Cowboys-Green Bay Packers post-season showdown at Jerry’s Palace. 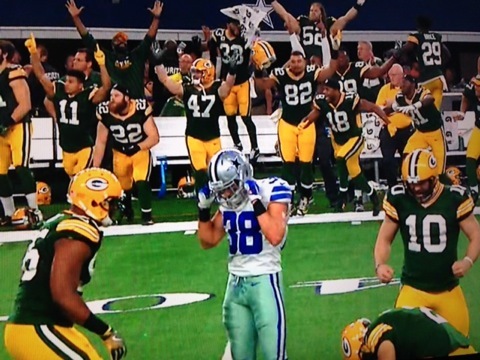 Green Bay survived a furious Cowboys comeback to win 34-31 at the buzzer on Mason Crosby’s 51-yard field goal. On the previous play, Packers QB Aaron Rodgers rolled to his left and completed a near-miraculous 35-yard sideline throw to tight end Jared Cook on a third down and 20 play. For the record, former Dallas newspaper columnist, radio host and loathsome longtime Rodgers hater Skip Bayless termed it an “easy pitch and catch.” Fans of both teams are unanimous that he should be spread-eagled, coated with house brand dog food and left out somewhere in the freezing Green Bay cold for a night before being devoured by a pack of jackals. But I digress. Cowboys-Packers averaged a super-sized 2,254,041 D-FW viewers and 891,574 in the advertiser-prized 18-to-49 age range. Not surprisingly, audiences peaked in the closing 6:45 to 7 p.m. segment, when the game had 2,850,271 total viewers and 1,144,935 in the 18-to-49 realm. Imagine what an overtime would have brought. Two years ago, the Cowboys’ equally crushing post-season road loss at Green Bay (highlighted by Dez Bryant’s overruled “catch”), came up a bit short in total viewers with an overall average of 2,210,758 but drew more 18-to-49-year-olds with 983,986. That one was also on Fox. In comparison, the Dallas Mavericks’ home win over the Minnesota Timberwolves on Fox Sports Southwest, moved up earlier to avoid a head-on collision with the Cowboys game, averaged 29,084 total viewers and 12,828 in the 18-to-49 realm. Sunday’s other NFL playoff game, the Pittsburgh Steelers’ 18-16 win over the Chiefs at Kansas City, was moved for weather purposes to prime-time on NBC. It surpassed the one million viewers mark (1,032,496), with 416,923 in the 18-to-49 motherlode. On Saturday, the New England Patriots’ playoff win over the Houston Texans in prime-time on CBS pulled in 945,243 total viewers. Earlier on Fox, the Atlanta Falcons’ postseason rout of the Seattle Seahawks averaged 916,159 total viewers. A non-football Friday was topped in prime-time by CBS’ 9 p.m. episode of Blue Bloods with 232,675 total viewers. ABC’s 20/20, which aired opposite Blue Bloods, led all programming among 18-to-49-year-olds (48,107). TEGNA8 won in total viewers at 10 p.m., but NBC5 had the edge with 25-to-54-year-olds (main advertiser target audience for news programming). Fox4 swept the 6 a.m. competitions and NBC5 ran the table at both 5 and 6 p.m.